Eco-Babyz: Urgent! Oppose Monsanto Takeover of the FDA. Urgent! 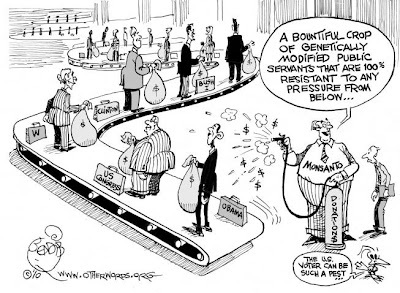 Oppose Monsanto Takeover of the FDA. Wouldn't it be nice if the ingredients in food you buy and feed to your kids were tested for safety? It's great to dream. Truth is, there is absolutely no safety testing required for the genetically modified ingredients in nearly every package at the supermarket. No, it's perfectly fine to chemically modify seeds in a laboratory and spray the crops with toxic pesticides so that nothing that's alive would eat them - and then feed it to us, humans. It is alarming, to say the least, that there is huge conflict of interest in the government. How can it even be legal for so many former Monsanto employees to work in the FDA and promote these toxic, cancer causing foods in our food supply? It's disgusting. If you're interested in the details, feel free to enlighten yourself. Meanwhile we need your help! Please sign the petition to oppose the appointment of Michael Taylor (former VP and lobbyist for Monsanto) as senior advisor to the commissioner at the FDA. Thank you for sharing! I'm signing the petition right now! Thank you for sharing! I also try to sign any petition against Monsanto!